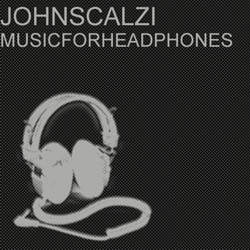 As part of the gradual and continuing process of returning to the Scalzi.com site all the crap I took down when I changed providers, I am happy to announce the return of Music for Headphones, my album of mostly instrumental electronic music that I banged together a couple of years ago. However, I am not merely content to give you the old, crappy, streaming Real Audio version that was up before; no, the new version features high-end variable-bit-rate mp3s, for the best sound quality while still nodding toward not punishing people with too huge a download (mostly). Also, I've added in an extra track which I haven't put up before: "Don't Stop," which features a couple of samples from Journey's "Don't Stop Believin'." Oh, stuff it, you snobs. It's pretty good. I'd get in trouble if I was trying to sell this, but I'm not; this is non-commercial exhibition only. So have at it. In any event, now all this music sounds better (or at least, less compressed) than before, so I hope you enjoy it. I'll note that when I listen to these tracks, I tend to jack up the high end a bit, because there's generally a lot of drumming and some of the high end can get lost. But I also tend to jack up the high end no matter what I listen to, so make of that what you will. 1. Acceptance (5.85MB) -- Possibly my favorite track I've done. It's pretty simple and trance-like, and has some nice swelling New Order-y synths in it. 2. Transformation (7.33MB) -- This one starts off very harsh and electronic and eventually becomes rather more acoustic and mellow; thus the title. 3. Why Don't You Love Me (7.97MB) -- A rather plaintive flute starts this one off; I think it sounds swirly and moody and a good aural approximation of what it feels like inside when you like someone rather more than they like you. One of the better ones as well. 4. Well Imagine That (5.42MB) -- More ethnic flutes; more moodiness. Something about ethnic flutes and moodiness that just go great together, y'know? 5. Athena (3.51MB) -- When Athena was three, I gave her a microphone and let her sing into it. This is what came out. She did all the instruments too! Well, no, not really. But maybe one day. 6. Don't Stop (5.91MB) -- I did it because I like Journey, so there. Also, it's an earworm of a piano line. 7. Night Flight (7.97MB) -- If I were writing background music for planetariums to play while they were doing exhibitions about the planets of the solar system, this is what it would sound like. 8. Clear That Up (5.47MB) -- This is what I imagine it sounds like to walk home in the fog after a clarifying "discussion" with a paramour that didn't end very well for you. 9. Kindertransport (8.43 MB) -- The "kindertransport" were trains that European Jews put their children on just before World War II to send them to safety to England; the trains would take the children to ships, which would cross the Channel, and then the children would live with distant relatives or sometimes even strangers. Needless to say in many cases those children never saw those parents again. I can't even imagine what it would be like to put my own child on a train like that, but this piece tries to evoke some of that emotion. I think this is probably the best composed piece I've done to date. 10. Converge to Merge (10.6MB) -- I call this my "Stairway to Heaven" piece, and when you listen I think you'll understand why. However, there are no bustles in hedgerows. Because that would be alarming. 11. Let's Fly Away (7.84MB) -- Yes, that's me singing. Yes, the voice is heavily treated. The actual reason is to cover up deficiencies both in the microphone and in my voice, but as it turns out, I really like the effect; it almost sounds like a guy leaving a song on his lover's answering machine, and I like that mental image. I'm not giving up my day job, but on the other hand, clearly I'm not embarrassed by the song, either. So there you have it. I hope you enjoy Music For Headphones, because it's probably the last you'll hear of me here for at least a week: I absolutely, positively have to finish writing The Rough Guide to Science Fiction Film this week or both my editors and my wife are going to murder me, and rightly so. So no more Whatever until it's done. You understand, I presume, that this is meant more as an incentive for me than as a punishment for you. Enjoy, and see you in February. Thanks so much! I'm so glad you put these up after I asked. I've been sharing Acceptance with everyone since you posted it here last month, and I can't wait to spread the rest of it around! Oh no! Surely not more Journey, John?! There's no Escape, Rick! Get it? "Escape"?!? Man, I kill myself. I love the album, John. Thanks a lot for posting it. If you, or anyone else is interested, I posted a review on my livejournal. Thanks again, I really enjoy the music. What a nice review. Thanks! Just a quick digressionary question, for my perhaps cold-addled brain. Why is it okay to post a list like this and how is it different from that peer-to-peer music swapping that everyone is so up in arms about? Not that I'm accusing the Scalzster of horrific acts of piracy. I'm sure he's not doing anything of the sort...I just don't know where the difference lays (lies?) (Lays, lies, I never could figure that one out) and am hoping someone can tell me so I don't accidentally cross it some day. "Why is it okay to post a list like this and how is it different from that peer-to-peer music swapping that everyone is so up in arms about?" Primarily because I am the person who created these pieces, mostly out of royalty-free loops, and therefore I have a perfect right to post them if I want. The exception would be the piece with the Journey samples, but inasmuch as I'm not selling the piece, and also the sample used are only a very small part of the entire song (probably less than 10 seconds), it's most likely covered by fair use. Ahhh...I see. So you can do this if it's mostly your own artisitc vision or mash-up, but if you just copied a bunch of stuff off your favorite cd's and posted the recordings for download straight up, that would be a no-no. Yes-yes? WOw! Good stuff! All this and he makes music, too. Did I mention I make the music, too? Electronical stuff, in fact. You can get 2 whole albums here at this link. My other album is "The Navigatrix Soundtracks" which is here. Both, I believe, are excellent. I am long overdue for getting the 2 newest albums out. But I'm getting there.